China coach “Jenny” Lang Ping is a legend in her country. Back in her playing days, when the outstanding hitter led China to the World Championship title in 1982 and Olympic gold in 1984, she was known as the lady with the “Iron Hammer”. “I feel no pressure. I am good at what I do,” said Zhu. And she has every right to be confident. The 1.95-metre tall hitter first caught the eye of the volleyball world when she was named MVP and Best Spiker in 2012 at the Asian Junior Championships. The following year she was awarded the Best Outside Hitter and MVP titles at the FIVB Women’s Junior World Championship and her team won the championship. These exceptional performances have paved the way to a place in the national team, with which she promptly caused quite a stir in 2013. At the iconic Montreux Masters, she was the top scorer with 105 points, second-best server and second-best spiker. She also helped China to silver in the FIVB Volleyball World Grand Prix, as one of the team’s top scorers in 2013. “Sometimes young players like Zhu Ting have ups and downs, so we want to let her watch some games to learn and then come into the game without any pressure. 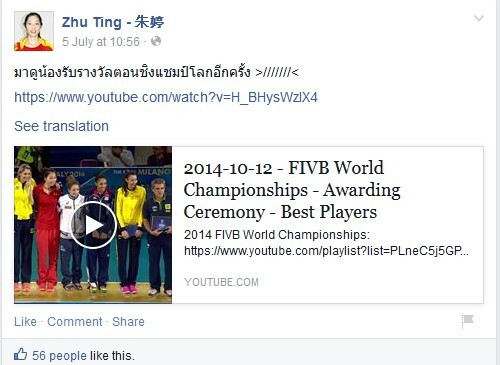 We are trying to develop our young players; this is our goal,” said Lang Ping. The coach rejigged the Chinese squad after her appointment in 2012, putting her faith in younger players. Zhu (20) is just one of several players with a promising future.Yuan Xinyue (18), who was voted “Rookie of the Year” in China, is another top performer in the national team. Last year, China surprised many by winning silver at the FIVB Volleyball Women's World Championship and Zhu was a key factor in this success. With an incredible 32 points, Zhu smashed China to a 3-1 victory over hosts Italy in the semifinals of the World Championships. She was the tournament’s top scorer and was also selected for the Dream Team as the Best Outside Spiker. However, the youngster has kept her feet firmly on the ground. Ask whether she already sees herself as an idol for young players, she just laughs and shakes her head: “No.” After all, she is only in the early stages of her career. Over three decades after the triumphs of “Iron Hammer” Lang Ping, the golden times could be about to return for China – thanks in part to their top young hitter Zhu Ting.